Located in the east of China, Jiangsu spans a total area of over 100,000 square kilometers, making it roughly the same size as Bulgaria. The province is bordered by the Yellow Sea to the east, Shanghai to the southeast, Zhejiang to the south, Anhui to the west, and Shandong to the north. The capital city of the province is Nanjing, located roughly in the center of the province. The name Nanjing means ‘Southern Capital’ and the city has been the capital of China on several occasions throughout history. Nanjing was the Ming Dynasty’s first capital, and for a brief period, under the Nationalists, Nanjing was also the capital of the Republic of China. Jiangsu came into its own during the Song Dynasty when the Grand Canal allowed Jiangsu to develop into an important trade center, and made possible the sale of its rice, salt and silk to other parts of China. In 1666, Jiangsu and Anhui were split, and Jiangsu’s border became much as it is today. From the 1840s onward, Jiangsu increasingly prospered from growing Western trade and influence. Shanghai during this period grew from a small Jiangsu town to one of China’s largest and most cosmopolitan cities leading Shanghai to eventually become its own province-level municipality. That said, Jiangsu was much ravaged during the 1851-1864 Taiping Peasant Rebellion. During the Rebellion, Nanjing became the Taiping capital and was re-named Tianjing – Heavenly Capital – until it was recaptured in 1864. Nanjing also suffered heavily during the 1937-1945 Sino-Japanese war which led into World War II. After capturing the city in 1937, the Japanese killed an estimated 300,000 Chinese civilians and raped countless of women in what has come to be known as the Nanjing Massacre. 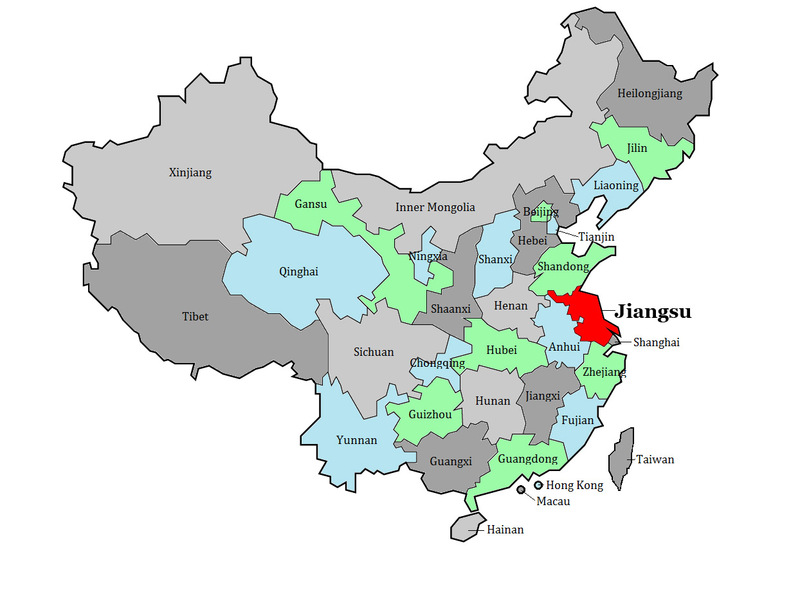 Jiangsu has a population of over 79.5 million people, equivalent to Germany. Over 96% of Jiangsu’s residents are Han. The rest are made up of smaller minorities, such as the Hui, Man, and Mongolians. The Hui are the largest minority group in the province. Once a largely rural region, since China’s 1978 market reforms, the province become increasingly urbanized. Now over half of Jiangsu citizens live in cities. Jiangsu ranks near the top in industrial output among China’s provinces. Key industries include the production of machinery, electronics, petrochemicals, textiles, silk reeling, foodstuffs, and buildings materials. The area around Nanjing is an important industrial base known for the production of automobiles and automotive parts, chemical fertilizers, detergent raw materials, electronics, machine tools, cameras, textiles, cement, and sundry building materials. Jiangsu also holds significant wealth in mineral resources including iron, copper, lead, quartz, zinc, potter’s clay, and marble. 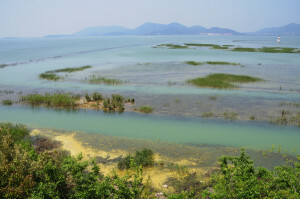 Jiangsu is also rich in salt which has been mined in the province for centuries. Coal is abundant in the province, and it appears that there are also significant offshore petroleum and natural gas reserves. In addition to manufacturing and mining, Jiangsu’s abundant water and significant arable land means that Jiangsu is one of the richest agricultural provinces in China. Often called “the land of fish and rice”, approximately 60% of its farming land is dedicated to rice production with the remaining land producing wheat, cotton, fruit, silk, and tea. The province also raises cattle, pig, and poultry. Aquatic products also generate significant revenue, and include swordfish, whitebait, yellow croaker and hairtail fish as well as prawns, crabs, and other shellfish. Jiangsu is very flat, composed mostly of a wide alluvial plain created by deposit of sediment over a long period of time by the flooding of its rivers. The alluvial plain covers over 65% of its area, with another almost 20% of its land is filled by lakes, rivers, and waterways. Due to the province’s flat topography and coastal location, most of the area is only 45 meters above sea level, meaning that Jiangsu is not only the lowest but also the flattest province in China. 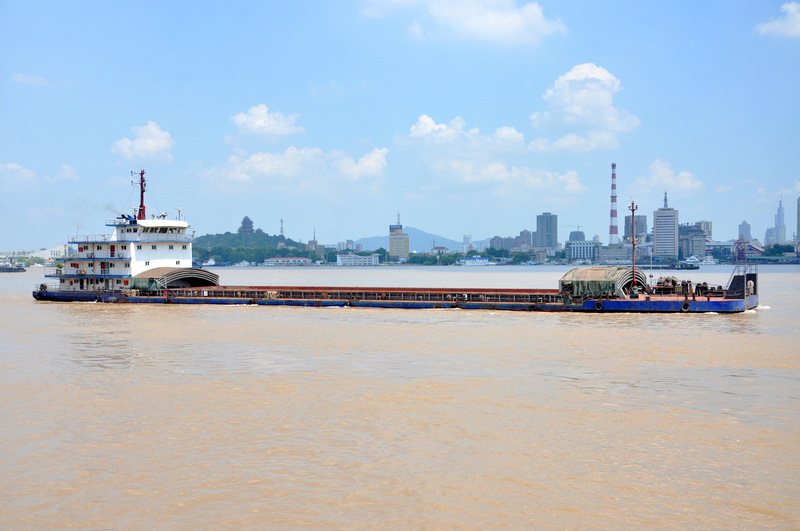 The Yangtze – its largest river – travels through the heart of the province effectively cutting Jiangsu in half. While there is very little geographical difference between northern and southern Jiangsu, the area north of the Yangtze is much poorer than the south. Hills fill Jiangsu’s southwestern corner and its extreme north. At a height of 625 meters, its highest mountain is Mount Yuntai, in northern Jiangsu near the Yellow Sea. Located on the Yangtze River and encircled by Ming-era walls, Nanjing’s modern architecture is interwoven with leafy streets, parks, lakes and the river. Within the city the Memorial Hall of the Nanjing Massacre is an important stop. The museum documents the atrocities that Japanese soldiers committed against the Nanjing population following their capture of Nanjing in December 1937 during the early part of the Sino-Japanese War. On the eastern edge of Nanjing, the Zijin Mountain scenic area offers forested parks as well as interesting historical sites such as Sun Yatsen’s Mausoleum- recognized as the founder of modern China, the Botanical Gardens, the Ming Xiaoling Tomb – the only Ming emperor to be buried outside of Beijing, and the Linggu Temple – containing the Beamless Hall, built out of brick and stone without any overhead structural support beams. 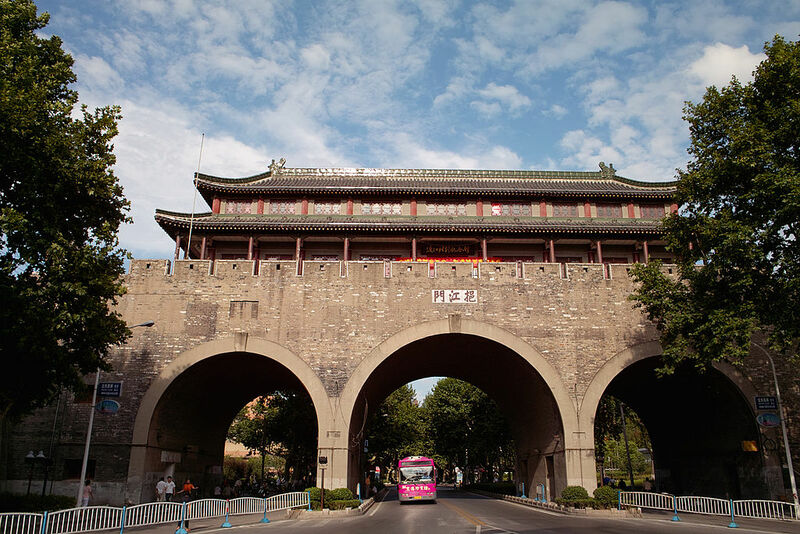 Other Nanjing sites of interest include the Ming Palace Ruins in Wuchaomen Park, the Jiming Buddhist Temple first built in CE 527, the Fuzi Confucian Temple, a center of Confucian study for 1500 years, where the Ming ruins are scattered, and the 530 hectare Xuanwu Lake Park. Around Nanjing, Qixia Temple is one of China’s most important Buddhist seminaries. Behind the temple, the Thousand Buddha Cliff in which caves housing stone statues can be seen carved into the cliffs. Behind the cliff, trails meander by pavilions and natural landscape. Once described by Marco Polo as one of China’s most beautiful cities, Suzhou has seen most of its heritage sacrificed to modernization or destroyed during the Cultural Revolution. That said, many beautiful gardens and sites of historical interest still remain. Out of these gardens, one of the most famous is Wangshiyuan, which means “Fisherman’s Garden”. 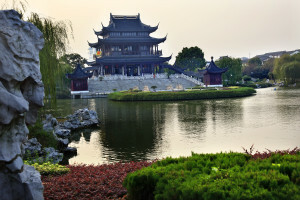 Other Suzhou gardens include the 5.2 acre Humble Administrator’s Garden, the Lion’s Grove Garden, , and the ‘Garden to Linger In’ designed by a doctor as a place for his patients to recover. Also of interest in Suzhou are the IM Pei-designed Suzhou Historical Museum and the Suzhou Silk Museum which documents Suzhou’s 4000 year old silk history. 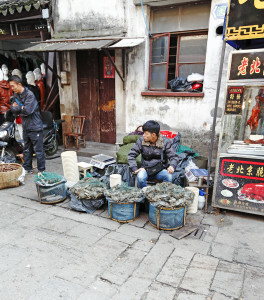 Suzhou old streets – Pingjiang Lu and Shangtang Jie – give a feel of what the city was like before all its canals were filled. 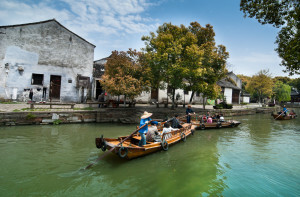 Nearby Suzhou is the canal town of Tongli. With its traditional facades, black-tiled roofs and cobblestone pathways running alongside canals, the charming town gives a much better sense of what China’s canal cities were like before being replaced by modern conveniences.